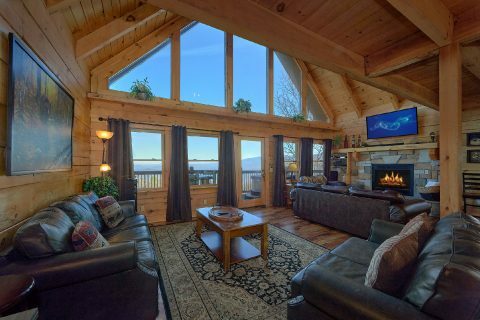 Looking for a luxury Gatlinburg cabin with an indoor pool? 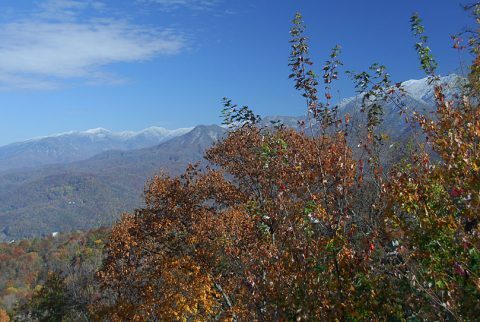 Look no further than "Gatlinburg Splash" in Smoky Mountain Village Resort! 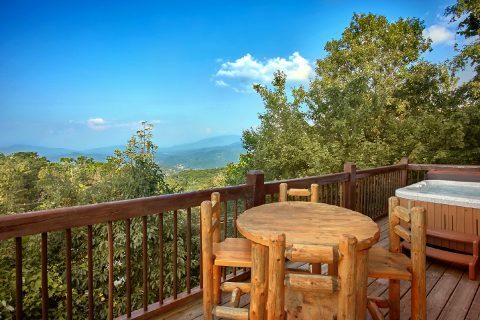 From this cabin's prime location in the mountains above Gatlinburg, guests of this luxury rental can enjoy beautiful views, top-notch amenities, and convenient access to Downtown Gatlinburg! 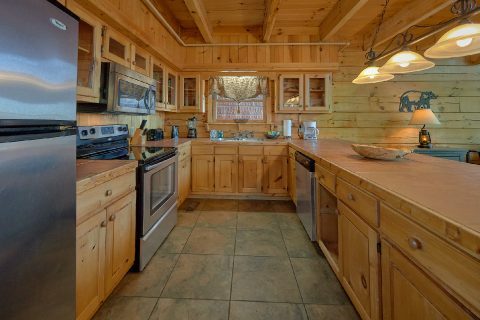 Though this rental is only 2 miles from Ober ski mountain and 3 miles from Gatlinburg, your cabin also makes it easy to reach the national park and Pigeon Forge, TN! 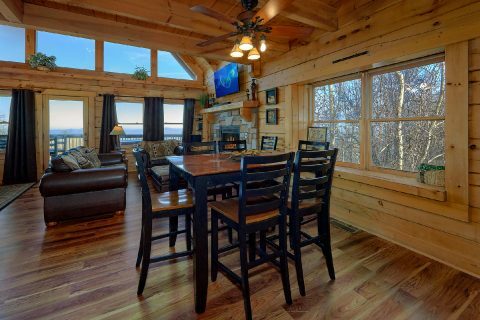 Needless to say, this cabin in the heart of all the action makes it easy to experience your Smokies vacation to the fullest! 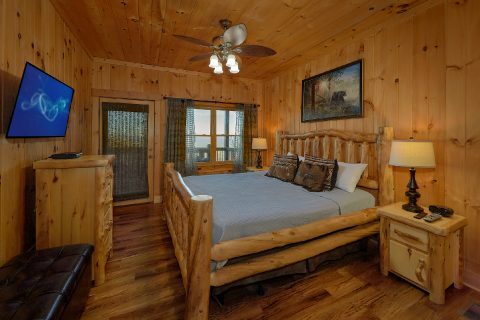 When you aren't busy living it up at top attractions, you can relax and play in your quality cabin in the mountains. 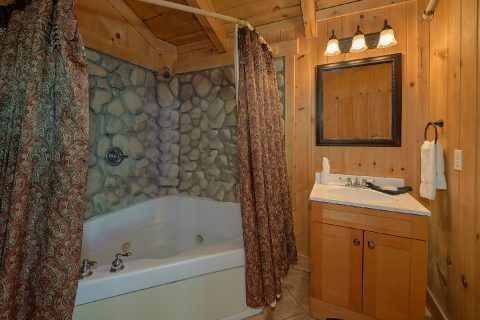 Splash and swim for hours in this rental's indoor pool area. 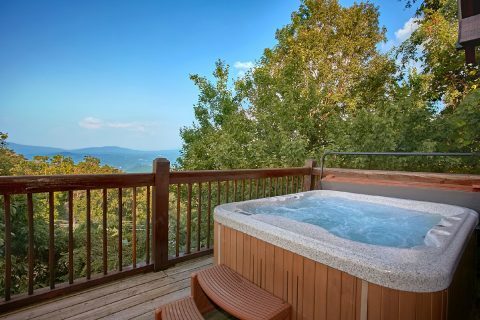 Sit back in the warm waters of the hot tub on the main level's deck. 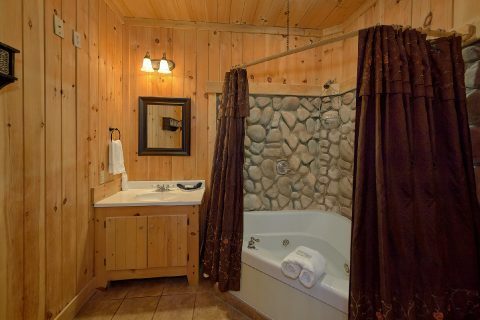 Enjoy a relaxing dip in one of your rental's jetted tubs. 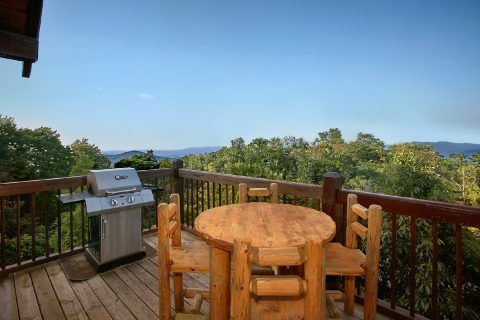 Or just admire the mountain view where you can see for miles and miles. 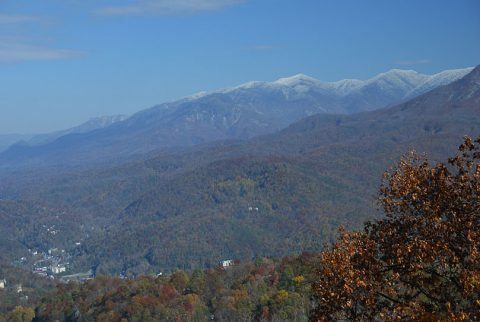 After the sun goes down, you can even see the lights of Downtown Gatlinburg glittering in the night. 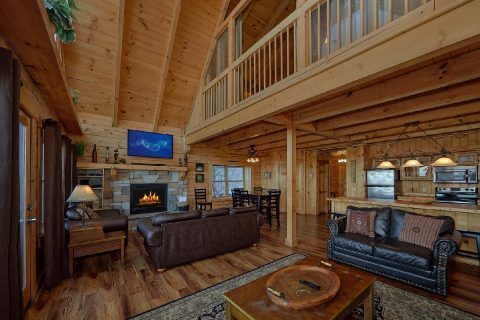 On the main level, you can enjoy a quality movie experience in the living room complete with a 52" HDTV, Blu-Ray player, surround sound, and comfortable leather chairs. 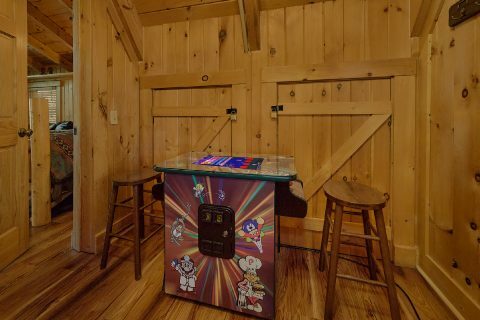 Upstairs, you'll find plenty of fun and entertainment in the game room with a pool table and a sit-down arcade game. 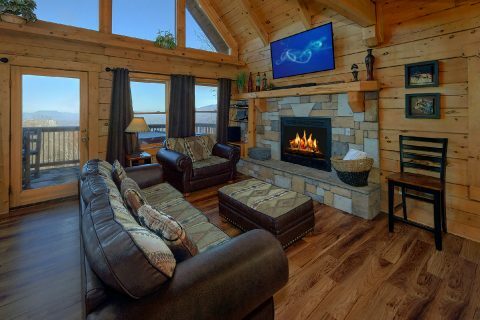 This room also boasts a large window that makes this the perfect spot to admire the incredible view. 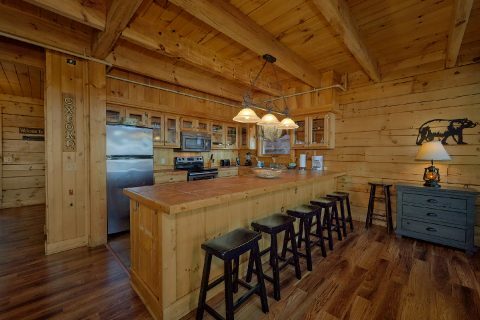 Additionally, this game room area comes with an iPod Dock, a CD player, a pub table with 4 chairs, and board games! 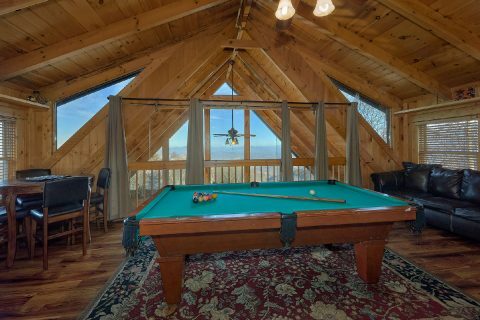 This game room also has a queen bed. 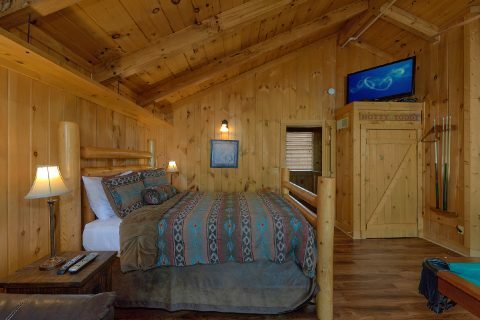 On the lower level of your cabin, you'll find 2 more king-size bedrooms that each boast televisions, private baths with jetted tubs, and access to a lower deck. 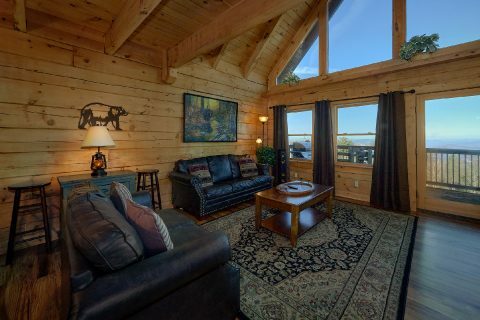 Book "Gatlinburg Splash" in Smoky Mountain Village Resort today to save big with a special 15% discount! 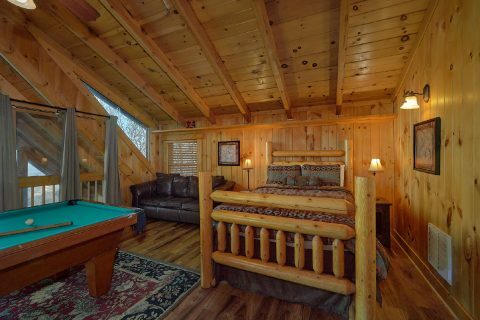 Simply book online with Cabins USA Gatlinburg to enjoy a premium cabin with an indoor pool today!